Within the Air-to-Air Refuelling Initiative of the EDA several Nations have agreed to co-operate in a multinational Programme: The Multinational MultiRole Tanker Transport Aircraft Fleet which will provide additional tanker and transport aircraft capability in Europe. The MMF Programme will provide air-to-air refuelling, transport of passengers and cargo and medical evacuations (based on the Airbus A330-200). Agent for the NATO Support & Procurement Agency (NSPA). NSPA will then be responsible for Life-Cycle Management of the fl eet. The fi rst aircraft delivery is planned for mid 2020. The Programme was initially launched in July 2016 by The Netherlands and Luxembourg. Germany and Norway joined the Programme in 2017 and Belgium followed in early 2018. This arrangement is open to other European Nations who have expressed their interest and additional aircraft are already considered as options in the current contract to accommodate the potential operational needs of further nations. The Airbus A330-200 is a new generation strategictanker/transport aircraft. The large 111 tonnes basic fuel capacity enables the aircraft to excel in air-to-air refuelling missions without the need for any additional fuel tanks within the passenger area. The aircraft is offered with a choice of proven air-to air refuelling systems. Thanks to its true widebody fuselage, it can also be used as a pure transport aircraft able to carry up to 267 troops, or a payload of up to 45 tonnes. It can also be easily converted into Medical Evacuation Confi guration to accommodate up to 6 Intensive Care Units and 16 stretchers. The contract with Airbus Defence and Space was signed in July 2016 and the Programme Division was setup on 1st September 2016 in Bonn. The MMF contract covered the acquisition of 8 aircraft and options for up to 3 additional aircraft, potentially increasing the total number to 11 aircraft. Many nations are closely following the Programme and showing interest in the additional options available. The A330 MRTT can perform military air transport, air-to-air refueling and MEDEVAC (Medical Evacuation) roles, including a combination of those roles in one mission. The aircraft for the MMF is equipped with two under-wing hose & drogue refuellig pods and a refuelling boom. On February 5th the Airbus A330-200 Manufacturers Serial Number (MSN) 1911 took off for the first time from Toulouse Airport. This was the first flight, Maiden Flight, of the aircraft soon to be transformed into the second unit of the Multinational MRTT Fleet (MMF). The first MMF aircraft took off for the first time into the clear and cold skies of Madrid on Wednesday 28 November 2018. This is the first MMF airplane fully configured as an MRTT first flight, after completion of the production phase at the Airbus DS facilities in Getafe. 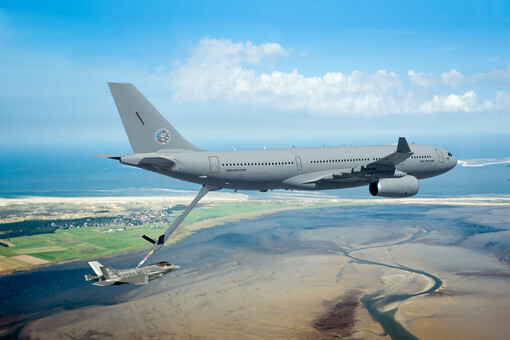 Belgium has now joined the multinational effort to acquire a European fleet of Multi-Role Tanker-Transport (MRTT) Aircraft, thus becoming the fifth nation to participate in this initiative, joining The Netherlands, Luxembourg, Germany and Norway. In a signing ceremony on 25 September 2017, the current Multinational Multi-Role Tanker Transport Fleet (MMF) contract was amended to include both Germany and Norway as participants to the MMF project along with the Netherlands and Luxembourg. Germany and Norway officially joined the European/NATO programme to acquire Airbus A330 Multi-Role Tanker Transport aircraft along with Netherlands and Luxembourg. On 16 February 2017, the Defence Ministers of Belgium, Germany and Norway signed a Declaration of Intent to join the European Multinational MRTT Fleet (MMF) of Airbus 330-200 transport and tanker aircraft, created by the Netherlands and Luxembourg. For further information about the MMF Programme, please contact the Programme Division or the Prime Contractor.